An extension of our Central London location! If you live in the North London area, we invite you to come join us every Sunday at Bernie Grant Arts Centre. We look forward to welcoming you, your family & friends! We’re all on a journey together to become more like Jesus – loving God, loving people, building the church together. Below are a few things we do that will help you get more involved. Groups are a great place to meet people and make friends. Our groups get together to have dinner weekly. They take place in various forms and usually meet in homes, coffee shops or restaurants. Groups are a way for you to find a place where you belong, connect and share life with others. If you’re new to Church and would like to find out more or simply meet people in Church – Engage is for you. It takes place every Sunday 15 minutes after each service. 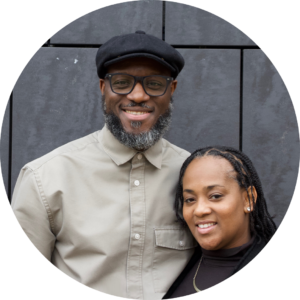 Engage is an introduction to who we are as Hillsong Church London. Enjoy some refreshments whilst meeting some of the team. They’ll answer any questions you have, introduce you to others and help you get involved in the areas that interest you. Join us this Sunday – we can’t wait to see you there! Jerry & Kath have been married over 20 years. Kathleen, born & raised in Tottenham & Jerry moved to the north when they got married. They are both passionate about this part of the city & are truly honoured to serve as leaders in our North London location.